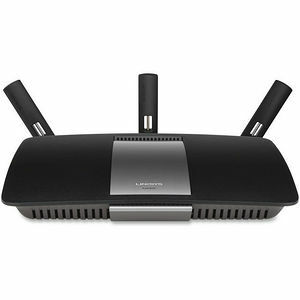 Perfect for HD video streaming, this dual-band router delivers speeds of up to N600 + AC1300 Mbps. Four Gigabit Ethernet ports make it easy to share data quickly across your network and to external devices. You can use the high-performance USB 3.0 port to attach a storage device and quickly transfer large files or share devices across your Wi-Fi network. Plus, the USB 2.0 port is perfect for smaller file transfers or a dedicated printer. Beamforming focuses the Wi-Fi signal directly to your smartphones, tablets and laptops instead of sending out a general transmission for a more efficient network with a wider range. Smart Wi-Fi lets you access your network anytime, anywhere. Using your browser or the Smart Wi-Fi mobile app, you can prioritize devices or websites, control content, monitor network activity and more. Advanced WPA2 encryption and SPI firewall help keep your network and personal information safe and secure.